The Cardinal Railing System is comparable to leading national brands at an economical price. Available in black or white, these systems are engineered with FIBREX® Material for superior performance. Luxury, great looks, Long lasting, Beautifully engineered. 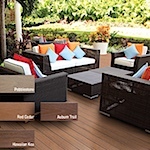 Paldeck Advanced PVC Decking Offers Superior Fade, Stain and Moisture Resistance. Features smooth or wood grain finishes with a protective film to resist dirt and scratches. The edges are sealed for superior weather resistance. 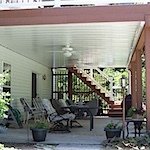 Zip-Up Underdeck system installs easily under the upper deck floor, creating a watertight "ceiling" for the patio...providing more space for relaxation and entertainment.